out of this world, delicious brownies with a little snap, crack & pop! Mix and bake brownies according to package directions in a lightly greased 9 X 13 inch pan. Remove from oven. 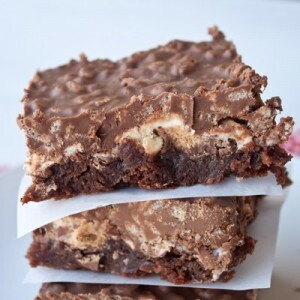 Sprinkle peanuts, chopped Reese's Peanut Butter Cups, and Marshmallows on top of the brownies and return to the oven for another 5 minutes or until the marshmallows are puffed up and golden. In a large bowl, microwave chocolate chips and peanut butter on high for one minute and stir until melted and creamy. Stir in Rice Krispie cereal. Pour the Rice Krispie mixture over the top of the brownies. Cool in the fridge for at least 2 hours.